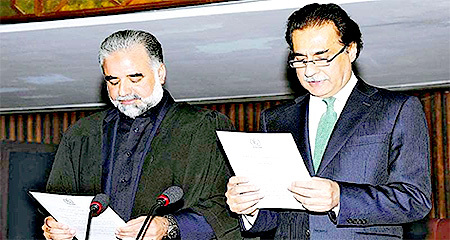 Sardar Ayaz Sadiq, MNA, has been re-elected to the post of Speaker of the National Assembly in the aftermath of NA-122 bye-polls. During a sitting on November 09, 2015 the Members of the National Assembly voted for the position of Speaker. Sardar Sadiq secured 268 votes while member of the Opposition, Mr. Shafqat Mahmood, MNA, (NA-126, Punjab, PTI) secured only 31. This is a positive indication of the democratic process being followed, where the Speaker was lawfully de-seated by an Election Tribunal in August 2015 and has been legitimately re-elected to the post. The Minister for Interior, Chaudhry Nisar Ali Khan, MNA, (NA-52, Punjab, PML-N) announced to the House various comprehensive measures being taken to control corruption and improve performance in the subordinate organisations of the Ministry of Interior. It is highly unfortunate that while Federal Ministers are answerable to the Parliament, yet most Ministers are hardly ever present in the Parliament, let alone inform the House about progress within their Ministries. This suggestion of the Minister would substantially improve the oversight of the Parliament over the performance of the Government in addition to their reporting to Committees. PILDAT strongly supports Chaudhry Nisar Ali Khan’s important suggestion that the Business Advisory Committee should create rules making all Ministers bound to present their performance to the House. In addition, the Annual Year Books by each Ministry should be regularly laid in the House. The ISPR released a statement on November 10, 2015 stating “the need for matching / complimentary governance initiatives for long-term gains of operation and enduring peace across the country,”1 which was unfortunate and uncalled for. Even more unfortunate had been the voices in the Parliament that seemed to justify the statement. Syed Khursheed Shah, MNA, (NA-199, Sindh, PPPP) termed it an “important hint” while Mr. Shafqat Mahmood, MNA, stated that it should be a matter of concern for the PML-N. The controversy ebbed its way into the Senate where Parliamentarians expressed their disappointment with governance, however assured the Government of their continued support. On November 02, 2015, Senator Taj Haider, PPPP tabled the National Accountability Amendment Bill as a Private Members’ Bill to restrict NAB’s jurisdiction to Federal departments and ministries. The Bill was referred to the Senate Standing Committee on Law, Justice and Human Rights. Senator Haider stated that the 18th Amendment passed in 2010 provided for greater autonomy to the provinces and anti-corruption is now a residuary subject. With already limited impact on social indicators of the 18th Amendment, and a growing disparity between the four provinces, PILDAT recommends that this amendment does not stand. Senator Haider undoubtedly introduced the amendment to improve the efficiency of anti-corruption agencies at the Provincial level. However, Parliamentarians ought to be wary of the fact that this may create disparities on the policies and procedures governing corruption. The governance of corruption ought to be uniform at the Federal and Provincial levels. As part of its oversight activities, Senator Talha Mehmood, JUI-F, held the Government accountable for the inordinate delay in recruitment to the National Counter Terrorism Authority – NACTA, through a question posed on November 11, 2015. The agency has been without a formally appointed Chairman for the past six years, which is approximately how long it has existed. The Government informed the Senate that NACTA still has no service rules. To date, vacant posts are filled either from the Establishment Division or through fresh recruitment. Minister Baligh ur Rehman, while informing the Senate that new service rules had been prepared, did not indicate when they would be implemented. Legislators of the Provincial Assembly of Balochistan passed four resolutions during the 22nd session. The resolutions focused on the equitable distribution of resources to the Province from the entire country. One issue that has resounded over the course of the third Parliamentary year in both Balochistan and Khyber Pakhtunkhwa has been that of the China-Pakistan Economic Corridor (CPEC).